To hell with food pairings and champagne flutes. JP and I wanted wine we could open without a corkscrew and Ah-tan was craving barbecue. 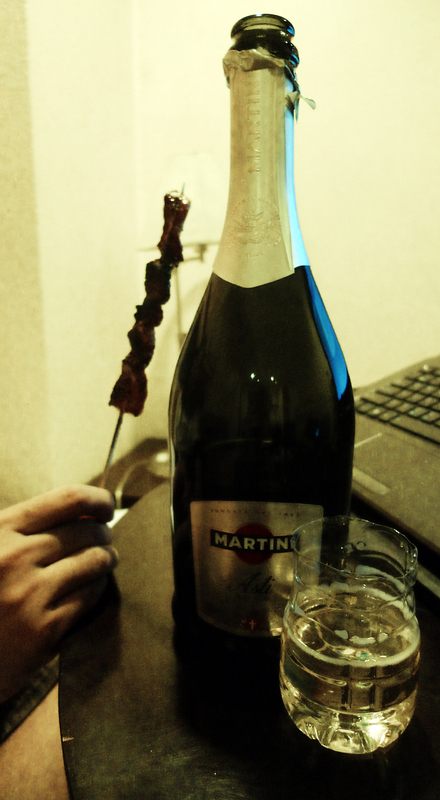 So we bought a bottle of Asti and a plastic bag full of pork skewered on sticks. An empty water bottle was MacGyvered into a cup – all the better to balance barbecue sticks on – and we had a party*. *We sat around shooting the breeze while Ah-Tan battled dragons and ravaged innocent villagers.